As we passed the throw-in sites along the bank of Loop Road in Lee State Natural Area, the wind kicked up, rain clouds approached and the sound of thunder made us look for a place to weather the storm. A few bends beyond Interstate-20 we found a gravel bar with small trees, so we pulled the canoe onto the bar, and unloaded the gear, extra life jackets and the tarp. Turning over the canoe and taking our paddles, we worked quickly to improvise a shelter. While sitting on our lifejackets to make sure no part of our bodies touched the ground under our temporary shelter, we discussed the river as the storm rolled over us. During the summer months in South Carolina, thunder storms can occur every afternoon. The year 2008 was a drought year and rainstorms were infrequent, so during a ten-day survey trip of the river it only rained twice. After an hour and a half rain break, we were back on the river to record our observations for the boating guide. Our first day started early in the morning at the Highway 15 Landing near Bishopville. We glided past gravel bars and around downfall, under a railroad bridge and an interstate, observing and recording all we saw while paddling this zippy river. We observed an upper coastal plain ecosystem with an overstory of sycamore, sweetgum, loblolly pine, red maple and many species of oaks and an understory made up primarily of river birch, dogwood and sourwood. Some of the fauna we viewed and recorded on our first day on the river included deer, turtles, snakes, alligators and many types of birds. 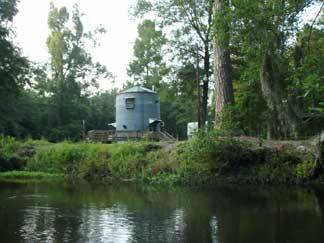 The Lynches Scenic River Water Trail Guide contains checklist tables for the observant boater to record their sights. We paused to assess possible sites for the Pee Dee Land Trust’s proposed Evelyn and Rivers Scarborough Camping Platform. A mile or so later, we spotted our shuttle vehicles sitting at the Highway 401 Landing. This 8-hour trip took us 15.5 river miles at a flow of 319 cubic feet per second (cfs) or 5.63 feet on the Bishopville gauge. The flow and stage foot numbers may be found on either the U.S. Geological Survey or S.C. Department of Natural Resources websites or in local newspapers. We unloaded and strapped down our boats on the trailer and headed to Lee State Natural Area to set up camp for the night and recharge our electronic equipment. Cooking a nice breakfast, breaking camp and setting up a shuttle run for the vehicles put us on the water a little later on day two. Two hours into the trip we had to choose whether to take the older river channel to the right or the newer river channel to the left. We decided on the river channel to the left and then log-jumped a fallen tree. Later we passed a large clear-cut logging operation that left one strip of trees standing near the water. We log-jumped three trees that were windblown across the river — one of many reasons better buffer ordinances are needed for our streamside riparian zones. Using a hand saw, we cut small branches out of our way as we paddled around the downfall. Along the entire length of the river, people have cut four-foot sections from trees that have crossed the river due to wind blow or bank erosion to enable small john boats and paddle crafts to easily float down the river. Day two took 6 hours from the Highway 401 Landing to the Highway 76 Landing, and we again headed back to Lee State Natural Area’s campground to spend the night. 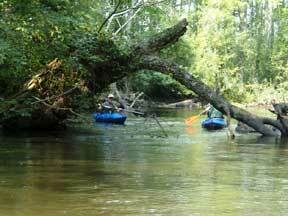 The trip was 10 river miles at a flow of 224 cfs or five feet on the Bishopville gauge. After breaking camp and running a shuttle, we were on the water by 10:30 a.m. The typically swift-moving current on the river at the Highway 76 Landing was slower and more lake-like than normal. Half-an-hour later, we did the limbo to get under a downed pine tree. Past this blow down, the floodplain is dense, lush and green, with lots of bird sounds. A Prothonotary Warbler crossed our path, and a kingfisher escorted us downriver. As we traveled under a power line crossing, we again had to choose which channel to take. Taking the channel to river left, the shorter path, we paddled stealthily around the bend and discovered three large bucks in full velvet. They watched us for a minute or so as they decided what to do. What a sight as they bounded off into the woods. This river section exhibits a distinct change of vegetation as the upper coastal plain begins to give way to the lower coastal plain. 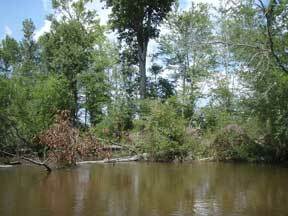 The vegetation changes from an oak, sycamore, and river birch-dominated ecosystem to one featuring more bald cypress and tupelo. After about two hours on the water, we saw our first cypress trees (on river left) and stopped for pictures. We ate lunch on a sand/gravel bar in the middle of the channel shaded by cypress. Around 2 p.m. we paddled under Interstate-95, entering a figure-8 section of the river where the trip becomes both mentally and physically challenging, as you choose the channels you wish to paddle and live with the consequences of your choices. When we began hearing traffic noise from S.C. Highway 403, we knew we had to choose channels that would take us to the far left side of the river. A few minutes after going under the Highway 403 Bridge in the far left channel, we spotted the Sardis Baptist Church Landing on our left. Day three’s paddle was 11 river miles in 7 hours at a flow of 374 cfs or 3.37 feet on the Effingham gauge. We again traveled back to our campsite at Lee State Natural Area for a hot shower, a camp stove to cook a hot meal and a cooling electric fan as we enjoyed the sunset. After a shuttle run, we launched from the Sardis Baptist Church Landing at Highway 403 at 10 a.m. The river channel at the landing is one of several anabranching channels (a type of braided channel with vegetation on the islands) in this section of the river. Here, the Lynches River meanders back and forth across the flood plain, affording the boater an opportunity to decide which channel to take. On any given day, one channel may be easier to travel than the others, so your day can quickly become longer than planned. Not long after leaving the landing we spotted old pilings crossing the river, which later research revealed were the remains of an old railroad crossing. This section has several old ferry, bridge and railroad crossings; look for places where old pilings cross the river, along with visual cuts or raised land forms stretching into the swamps. 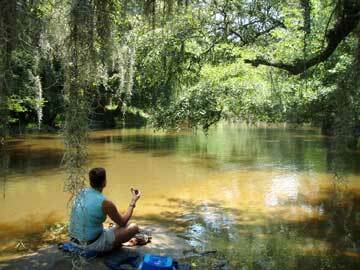 As we approached S.C. Highway 301, we heard the sound of rushing water along with traffic noise. The rushing water turned out to be an old road bed that had fallen to the bottom of the river during a flood event, creating a one-foot slide, or rapid, at low water - what fun! We stopped under the bridge to play in the slide. 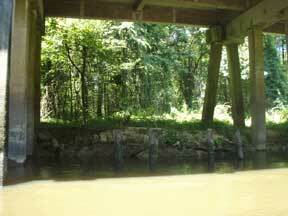 Additional old pilings under this bridge told us that other structures were built here in the past. The Highway 301 Bridge does not have a formal boat launch. However, a path on the river left leads to the road for primitive throw in/out access. I recommend that you do not leave any vehicles on the side of the road at the 301 Bridge. We did not stop here as our destination was another primitive throw in/out access at S.C. Highway 55, also known as McAllister Mill Road. 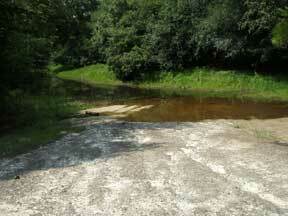 The access point is just beyond the McAllister Mill Road Bridge on river right, a large sandbar area. As we did not have Internet access on the river, I buried a vertical stick in the sand at the water line, and planned to check it the next morning. This is a good way to determine if the river is rising or falling in height. This section took 7 hours to paddle 15 river miles at a flow of 302 cfs or 2.91 feet on the Effingham gauge. We traveled to the Lynches River County Park campground where a hot shower and a good night's rest awaited us. This day gave us our shortest shuttle drive and easiest paddle of the trip. Arriving at the throw in on Highway 55 at 10 a.m., we found my buried stick about six inches from the river, telling us that the river level was falling. 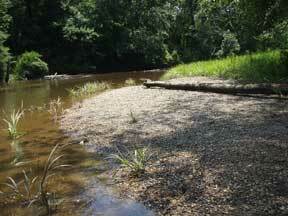 If we wished to spend the night on the river, good camping sandbars would be easy to find. As we started down the river, we noticed signs of beaver activity, such as chew marks on the bases of trees and on limbs over the river, as well as a possible den behind a root ball of a fallen log. Later, a river otter poked its head out of the water and took a look at us. Around noon, we arrived at the Lynches River County Park canoe launch, where we pulled our canoe into the launch area and stretched our legs by walking up the hill to check out the new educational discovery center. There we learned that rain clouds were forecast, so we quickly continued on. Just past the canoe launch the river width narrows and marl areas are visible along the banks and the river bottom. At the big turn in the river, there is a lake-like area where Sparrow Swamp joins the river. On past trips when the water levels were higher, I have paddled up the swamp channel to enjoy the blackwater ecosystem. After the large curve, the river straightens out for a while, and during times of higher water levels this is a popular spot for water-skiing on the weekends. At low water you can walk on the marl areas in search of Mesozoic-aged oyster fossils (Exogyra costata) and sharks teeth left long ago when this area was under the ocean. A light rain began as we approached the Highway 52 Landing and then soaked us as we finished loading the boat and equipment. This section took 4 hours to paddle 8 river miles at a flow of 244 cfs or 2.49 feet on the Effingham gauge. As it was a Friday, we headed home for the weekend. Kimberly and I met at the Highway 52 Landing early Monday morning and began paddling downriver at 9 a.m. This section is nice and straight, with a clear, well-defined channel. Motor boats use this section of the river, so we did not have to log jump or limbo under any downed trees. Limestone/marl outcroppings and sandy point bars make for interesting exploring. 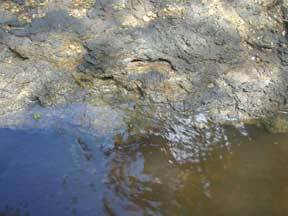 During low water, you can see sandy areas where cold water springs bubble up from the river's edge or flow into the river from riparian banks. Two to three miles below the Highway 52 Bridge, the road and rail noise from the highway diminishes and the stealthy boater will notice the quiet. Jeffords Landing, located about three miles downriver from the Highway 52 Landing, is a gravel landing situated on a river meander cut-off or oxbow. Because it was low water, we walked up the oxbow to photograph Jeffords Landing and the oxbow. We traveled past the oxbow on the new cut. A few miles downriver we discovered another new cut around an oxbow called "Crane Neck." Following a swim and lunch break on a sandy point bar, we entered a lake-like section, called "Shell Lake" by local boaters, before gliding under the Highway 49 Bridge. A sandy, public landing is just past the bridge on river left. After passing a high bluff on river left at a sharp bend in the river Jakes Lake enters the river on the right. We began searching for a good camping sand bar, finding one just upstream from Indigo Landing and an outfitter business called the River Rat. 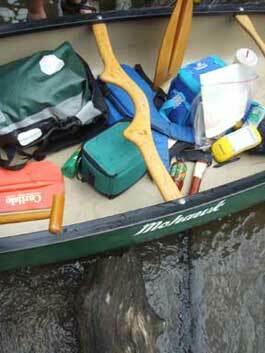 Owner Barry Frick rents canoes/kayaks and offers guided river trips. 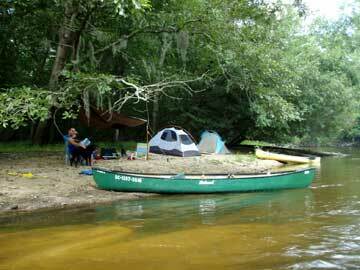 Camping on sandbars along the Lynches River during periods of low water where the point bars are located below the ordinary high water mark is legal in South Carolina. In the Lynches Scenic River Water Trail Guide we review camping opportunities as well as camping protocol and ethics. This section took 6 hours to paddle 11 river miles with a flow of 194 cfs or 2.11 feet on the Effingham gage. We began our paddle at 7:30 a.m., passing a small, public dirt landing known as Indigo Landing and Barry's outfitter and guide business on river left where we stopped long enough for Barry Frick, Randy Stone and Sam, a black lab, to join us. By 8 a.m. we passed Cockfield Landing on river right and glided under a set of power lines. Near the power line crossing, we spotted lots of beaver sign - gnawed trees, stripped branches we called beaver sticks and a possible lodge behind a fallen root ball. Around 8:30 a.m. we passed signs of an old bridge and landing area on river right. Then it was decision-making time – an oxbow with a new cut, a "Y" or a "T" view from river level. We looked at aerial photos and a Global Positioning System (GPS) device for information, river flow in each direction and for noticeable downfall to determine our navigation choice. We chose the new cut. Just past the new cut was a large house with an expensive wooden retaining wall, a good landmark indicating we were close to the Highway 378 Bridge. We stopped at the dirt landing at the end of Wicklow Road for a short break. Just past Lee Landing, on river right after the Highway 378 Bridge, we once more had to choose whether to take the new cut or the old channel. Again we took the new cut – this was becoming a pattern! At 11 a.m. we stopped for a break at a public dirt landing called Cemetery Road Landing. As we continued down the river our two guides regaled us with stories, fish tales and childhood memories such as learning to swim at Hitch Landing on this section of the river. We talked to Daniel Ward as he fished from a sneak boat just past our lunch sandbar stop. The last half of this river section of the trail is a large swamp floodplain forest, giving us many options as to which channel to paddle. At high water, even more channels would be open to the adventurous boater. The prudent boater should look for the best water flow and an open channel; luckily, we had maps, GPS and two guides with us, so our choices were well-thought out. (The path we followed is the trail/river line as presented in the published boating guide.) After passing Hitch Landing on river right, the channel winds its way across the floodplain to river left where there is a large rock bluff with fossils. Boaters use this bluff as a landmark to determine their next path. If you continue straight on this channel, depending on your choices you may end up a mile or so downstream of Half Moon Landing. We took a small channel with fast-flowing water, winding through the trees past an old shad fishing hut and operation that led us to a lake-like area above Half Moon Landing. We ended the day at Half Moon Landing, bidding our river guide Barry Frick and his lab, Sam, good-bye as we enjoyed Randy Stone's hospitality at his home. This section took us 10 hours to paddle 20 river miles with a flow of 237 cfs or 2.44 feet on the Effingham gauge. Randy Stone, owner of Swamp Fox Canoe Rentals in Johnsonville, and Terry Cook with the S.C. Forestry Commission joined us on Day 8. We launched our boats at 7:15 a.m. from Half Moon Landing and a few minutes later we passed a silo that has been converted to a house on river right. 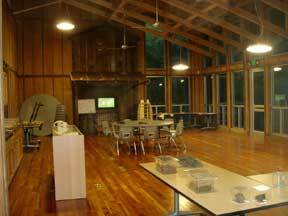 What a great way to reuse an old structure. This river section contains stretches of narrow, winding channels through the flood plain forest as well as lake-like areas. On one of the narrow spots that required making a choice of channel we encountered another shad fishing hut with a steel cable across the river to which the anglers attach a gill net. The net is placed in the water during certain hours of the day to trap the shad. As it was not shad season, the hut was empty and the line was bare. Shad run upstream to spawn during the spring months of the year. If you have never tasted shad row with eggs, I suggest a visit to Johnsonville in the spring. Find a local diner for breakfast or meet a shad angler on the river and join him/her for breakfast. We reached Odell Venters Landing in Johnsonville at noon, where we relaxed in the shade provided by the shelter located at the landing. We heard more river stories of lost or stranded persons along this river from Joe Cook, Terry's husband, who joined us for our picnic lunch. Leaving the landing after lunch, we drifted under the railroad bridge and past the only large, visible industrial complex next to the river as we headed towards "Hell's Gate." Randy and others had told us stories about this section and now it was our turn to experience it. 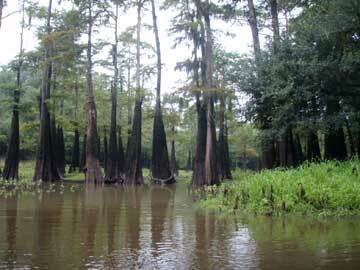 The area is so named because the wide, lake-like stretch of water funnels to a very narrow but deep channel between two large cypress and tupelo trees. The narrow gap between the trees, along with the swiftly flowing water, tends to cause large floating downfall to get stuck between the trees. We approached the gate in single file, got out of our boats, balanced ourselves on the logs and lifted our boats over the drifting logs. Once back in our boats, the water flowed swiftly and the channel was narrow and winding. I found this section to be one of the most beautiful areas of the trip, with clear, dark water, a white sandy bottom and mature swamp forest on either side of the channel. We parked our boats on a sandbar and took a dip in the cool, clear water. I photographed a gar fish swimming next to the sandbar as we proceeded to North Persimmon Bluff Landing. This section took us 8 hours to paddle 15 river miles with a flow of 261 cfs or 2.62 feet on the Effingham gauge. We started early as we had an hour-long shuttle ride to drop off our car and canoe trailer at Dunham Bluff Landing on the Great Pee Dee Scenic River. As we placed our gear into the boats at North Persimmon Bluff Landing, Randy told us that we had to decide which of three channels to take. 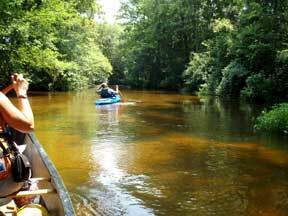 Since our shuttle was at Dunham Bluff, we chose the Lynches River out to the Great Pee Dee River and left Clark's Creek and Mill/Muddy creeks for another day. As soon as Terry, Randy, Kimberly and I pushed into the water, we saw the Y in the river; the right fork is Mill Creek, which leads to Muddy Creek and Snows Lake Landing. We took the fork to our river left. This channel took us into the Lynches River floodplain swamp forest. Randy told us that many years ago, people crossed the swamp by boat from Powell's Corner, Montgomery Plantation and islands in the swamp to use North Persimmon Bluff Landing to get to the town of Johnsonville. In a short while Hanna's Lake channel entered the Lynches on river left, several minutes later Little Hanna's Lake channel also entered on river left. 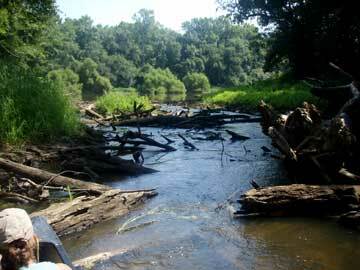 The next Y in the river has a short-cut - a channel to Mill Creek - on river right, and the Lynches on river left. The tides in Georgetown can cause the water to fluctuate around two to four inches in this swamp all the way to Johnsonville, so paddlers can't rely on visual cues alone to determine the direction and flow of the water. 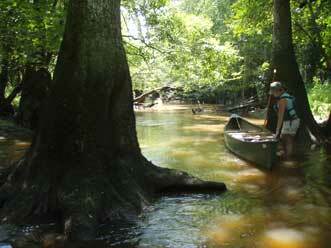 We proceeded through the forest as smaller swamp channels entered the Lynches main channel on our left. 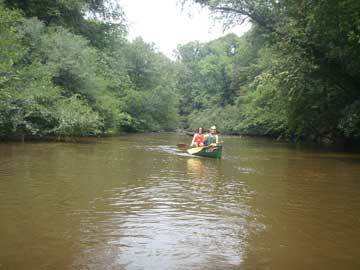 Mid morning we reached a wide Y in the river, which is the confluence area of the Lynches River and Clark's Creek. Clark's Creek appeared to be the best way to proceed as most of the water was flowing down the creek. 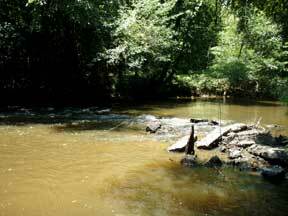 However, we had decided to travel Clark's Creek the next day so we proceeded to our left on Lynches River. If the river water level in the Great Pee Dee was at a high flow level, we would be paddling against the current as water pours up Lynches River and then down Clark's Creek. On this day the water level was low and we traveled with the current into the "Jaws of Hell." Because of the competing hydraulics between the two rivers, large log jams have a tendency to form in the middle of this reach. We took two major portages around log jams, and a few minor ones. This section was both mentally and physically challenging; it took us two hours to go one mile to reach the Great Pee Dee River from the Lynches River/Clark's Creek confluence. When we reached the sandbar at the Great Pee Dee, we took a swim break and gave each other high fives! 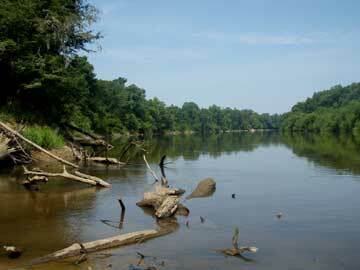 The Great Pee Dee River is a wide, scenic river with high, tree-lined banks on both sides. 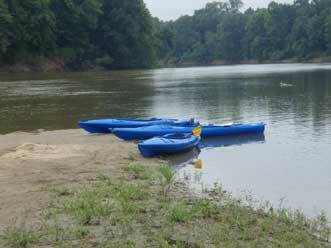 It only took us one hour to paddle to Dunham Bluff Landing on the Great Pee Dee River. This section took 6 hours to paddle 4 river miles on the Lynches River with a flow of 322 cfs or 3.05 feet on the Effingham gauge, and 2 river miles on the Great Pee Dee River with a flow of 1,971 cfs or 3.26 feet on the Pee Dee gauge. We left Persimmon Bluff Landing for our morning shuttle drive to Staples Lake Landing on the Great Pee Dee River, retracing some of our Day 9 miles down the Lynches River to the wide Y in the river that is the confluence with Clark's Creek. Kimberly and I were in a canoe, and Randy, Terry and her husband, Joe, were in kayaks as we floated down Clark's Creek with Snow Island (of Revolutionary War hero Francis “Swamp Fox” Marion fame) on our left. The only bridge crossing along this stretch is a private bridge to Snow Island about a mile below the confluence. Randy and Joe told stories of hunting and fishing on the river as we passed old hunting shacks. I believe this was our easiest day as we only encountered one tree across the river. As we approached the confluence with Muddy Creek, rain began falling. Since we didn't see lightning or hear thunder, we decided to continue. We paddled a short distance up Muddy Creek for pictures, then turned and continued on Clark's Creek. We stopped to gather data and samples from the limestone marl feature on river right, just below the confluence of Muddy Creek and Clark's Creek. A quick two miles later we chased a large alligator off the sandbar at the confluence with the Great Pee Dee. We swam and ate lunch on the sandbar and watched the alligator check us out from the other side of the river. Our last stretch was an easy 1.5-mile paddle on the Great Pee Dee while looking for the Staples Lake oxbow entrance on river right. Once in the oxbow, the landing appeared on our left. This section took 1.5 hours to paddle 3 river miles on the Lynches River with a flow of 319 cfs or 3.03 feet on the Effingham gauge; 4 hours to paddle 7 river miles on Clark's Creek; and one hour to paddle 1.5 miles on the Great Pee Dee River with a flow of 1,815 cfs or 3 feet on the Pee Dee gauge; for a total of 7 hours. 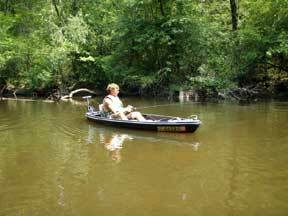 We did not paddle Mill and Muddy creeks from Persimmon Bluff Landing to Snow's Lake Landing due to low water conditions, however we show this route in the Lynches Scenic River Water Trail Guide so that adventuresome paddlers can give it a try. I hope you enjoy your adventure in the wilderness that is Lynches Scenic River.